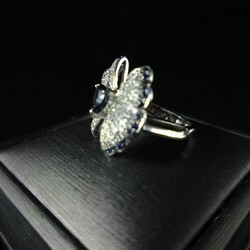 ■ 14K white gold, 90 diamonds 0.47ct, 26 Ke Sapphire 0.25ct. 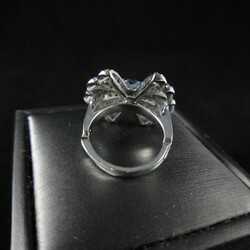 ■ Marie Liao Boutique is custom jewelry are all handmade custom master, takes 30 working days. For the sake of high quality will not accept urgent. 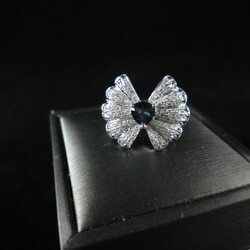 Marie Liao custom jewelry are all 18K (750) or 14K (585), easy to oxidation or discoloration, unless prolonged exposure to perfumes and skin care products. Therefore, women wearing makeup and jewelry should be in the Bahrain. 1. Do not place the same place different jewelry, precious stones and metals for a variety of different hardness, friction will produce damage. 2. 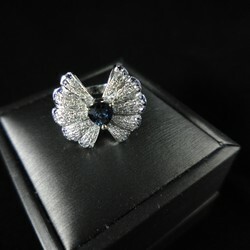 Select occasions to wear jewelry, to avoid the impact or wear jewelry and avoid exposure to chemicals, high temperatures. 3. To the usual wipe with a soft cloth. 4. 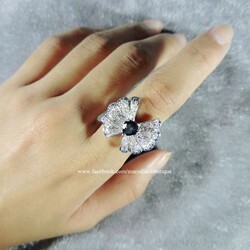 After a period of time to wear metal friction surface portions may be because the relationship becomes less bright, then you can back Marie Liao Boutique, jewelry store or please re-plating maintenance.